“So smart and so cute and so dark all at the same time. Sheesh.” —Caldecott medal and honor winner, Jon Klassen. Once upon a time there was a hungry lion and a bunch of adorable animals…what do you think happened next? There once was a hungry lion, a penguin (Well he was just here…), a little calico kitten (I could have sworn I just saw him…), a brown mouse (Now wait a second…), a bunny with floppy ears and a bunny with un-floppy ears (Okay this is just getting ridiculous), a frog, a bat, a pig, a slightly bigger pig, a wooly sheep, a koala, a hen, and also a turtle. Hey! What’s going on here… The very hungry lion is all set to enjoy an exciting day with his other animal pals. But all of a sudden his friends start disappearing at an alarming rate! Is someone stealing the hungry lion’s friends, or is the culprit a little…closer to home? 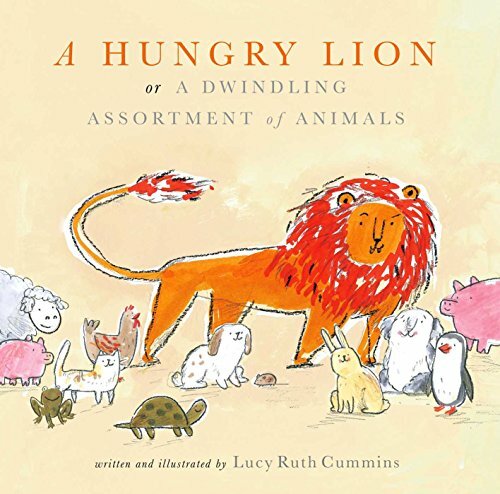 With sharp wit, adorable illustrations, and hysterical twists galore, this debut picture book asks—what do you think happened to the hungry lion’s friends?